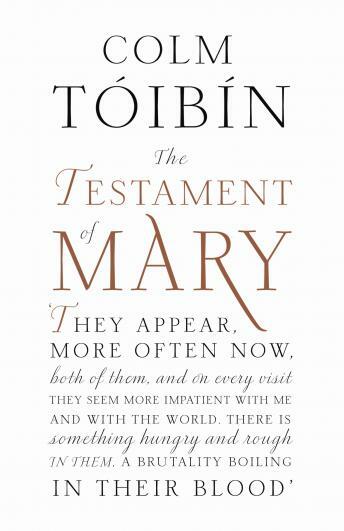 Shortlisted for the Man Booker Prize, Colm Tóibín's The Testament of Mary presents Mary as a solitary older woman still seeking to understand the events that become the narrative of the New Testament and the foundation of Christianity. In the ancient town of Ephesus, Mary lives alone, years after her son's crucifixion. She has no interest in collaborating with the authors of the Gospel. They are her keepers, providing her with food and shelter and visiting her regularly. She does not agree that her son is the Son of God; nor that his death was 'worth it'; nor that the 'group of misfits he gathered around him, men who could not look a woman in the eye,' were holy disciples. This woman who we know from centuries of paintings and scripture as the docile, loving, silent, long-suffering, obedient, worshipful mother of Christ becomes a tragic heroine with the relentless eloquence of Electra or Medea or Antigone, in a portrait so vivid and convincing that our image of Mary will be forever transformed. I am a devotee of Mary. As the book unfolded, l became more and more caught up in the "might have been " aspect of this story. I certainly cannot explain my reaction to this unorthodox interpretation of Mary and her Holy Week experiences, but somehow l found my faith strengthened. A whole new perspective on Mary and the events surrounding the crucifixion of Jesus. This is a fascinating and expertly written novel, but Meryl Streep's narration takes it to a whole new level. She's one of the best narrators I've ever heard.